Home Everything Fitness Tips to get back on track after a holiday. Tips to get back on track after a holiday. So if you guys are following me on my other social media profiles, you know I am just back from a week long Mumbai/ Dubai holiday. 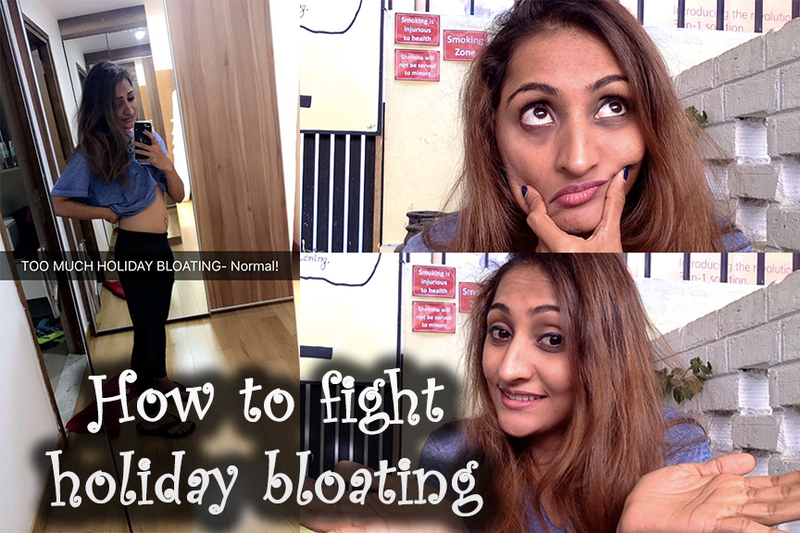 Feeling bloated and sick from all the junk food (and a little too much martini) today but I have a few tips that will get me on track. I do hope some of these help you too if you are recovering from a long- extended cheat week/ month/ life whatever. Don’t try to do the whole “ill start from Monday” non- sense. I have a rule when it comes to cheat trips. I start eating healthy and normal the moment my flight lands in Bangalore. So that is saying no to all the chips/ cookies etc from the moment I step out of the airport. By eating healthy, I mean eating whole- food and low fat. Saying a no to processed foods majorly, and avoiding eating too much fat. Workout the very next day. Now I am saying the next day assuming you land late at night (most international flights while travelling back to India). You will find some excuse like JetLagged, work overload, gym membership not renewed, its not Monday etc, but irrespective, workout. Even if it is a 20 minute jog, do it. But give your subconscious a message that you are back on track. As much as I love lifting heavy things, I really have to push myself to make it to the gym the day after my trip. But I always do it! Find a fitness buddy or hire a gym trainer that week to help you stay consistent. Don’t try to do too much the very first week you land. My will power is not very strong that I can go from 7 cheat meals a day to 0 overnight. Even if I do this, I know that I will break and binge eat sometime. So to help me stay on track, I still allow myself one cheat snack per day. This could be something homemade like chikki or besan laddoo etc. Mostly try to have this around my workout so I am not sitting idol post the cheat snack. The telling myself that I am still allowed one cheat snack everyday helps me stay consistent and focused with the rest of the day. Don’t step on the weighing scale. It will only make you sad and depressed. Stay as much as 2 weeks away from the weighing scale. You will be carrying a lot of water weight from all the excess sodium, and till you do not get that down, your weight will show higher than it normally is. Let me give you an example, the night I came back from my trip I was 55 kgs (normally I am around 51 kgs). In just two days I was down to 53.2 kgs! Now obviously I did not lose 2 kgs of fat in two days. In a week of being consistent with my fitness and nutrition I will be back to the 52-51 range. Give it a few weeks for your body to get back on track! Cardio up! Include 3-4 sessions of wake up steady state cardio or post weight training 30 minute steady state cardio in the first two weeks. This may feel long and monotonous and boring, but nothing fights holiday fat like steady state cardio. Make sure you are working in an aerobic state and not pushing too hard during these cardio sessions. A power/ brisk/ slightly inclined walk or stationary bike does the trick. Religiously avoid going out to eat for one week more. Stick to home food and even better, meal prep! You may not have time for this but boiling rice and beans in bulk to last you a few days is not as time consuming as you think. Even if you dont meal prep, it is important to prep for some quick healthy snacks or go grocery shopping and get loads of fresh fruits and veggies to munch on in between meals. It is also wise to add in fibre to your food. A big bowl of salad pre lunch or dinner with colourful greens and a low fat/ low sodium dressing is awesome! Select from seasonal veggies and even add a fruit if you want to sweeten your salad without adding artificial sweeteners or sugar. Start loosely tracking what you eat in either a food journal or MyFitnessPal. Don’t try to go on a fat loss program or stay calorically deficit immediately, since your body is still recovering and repairing from all the abuse you might have done to it over your vacation. Eat enough to maintain your weight and start a fat loss program only after 15- 20 days if required. Most of you will come back to your normal weight within this time and will not require to get on a fat loss program at all. Though I am not a huge fan of “detox tea’s”, I suggest sipping on organic dandelion tea infused with some fresh mint leaves and ginger slices every night before bed. This might slightly aid in digestion and even cleanse your digestive track. Making a big pot of this and sipping it throughout the day is also fine (only for a few days though). Parsley/ celery/ cilantro and cucumber smoothie is another fantastic option! All of these will help with water depletion and act as natural diuretics. Make small changes to pump up your metabolism and burn some fat. Having spicy food, sleeping in an environment colder than you are used to, adding on a pilates class or even having organic coffee pre workout/ physical activity. Even intermittent fasting for 12-16 hours everyday is proven to boost metabolism! Remember the 80/ 20 rule. To enjoy the freedom of eating whatever you want 20% of the time and still stay fit, you MUST be disciplined the remaining 80% of the time. I also believe everyone must learn how to cook healthy food and still make it tasty! Nutrition must never ever be boring- food should be fun! Visit my webpage roshnisanghvi.com for customised meal and fitness plans. Follow my snapchat and IG (@roshnisanghvi) to see what I eat post holiday and how I stay fit! Here is a link to my YouTube video with all the good stuff I ate during my Dubai trip!